London Walks has a simple but successful business idea. It offers guided walks through the streets of London and to a few places within striking-distance of London (see http://www.walks.com/). Each walk covers perhaps five kilometres and most walks last from 1½ to two hours. The standard charge is £8.00 but if you’re old or a student you get a £2.00 discount. The size of the groups we joined varied from a dozen (on a rainy day) to 79 (for the tour around the interior of Westminster Abbey). Here are some notes on three of the six London Walks that Emmy and I completed during our nine days in London, as far as I remember them (I’m writing this in Pontevedra, Spain, two weeks after our visit to London). The total distance we covered probably added up to around 25 kms over the six walks. I have ranked the three walks reviewed here from delightful to disastrous. Little Venice The title “Little Venice” is a bit of a misnomer because it suggests something like the canals of Venice with their gondolas and ornate renaissance buildings. But it is a forgivable misnomer because, on the day we did it, this walk was a delight from beginning to end – and even beyond the end. It took us through the Maida Vale area of Paddington in the inner west suburbs of London. 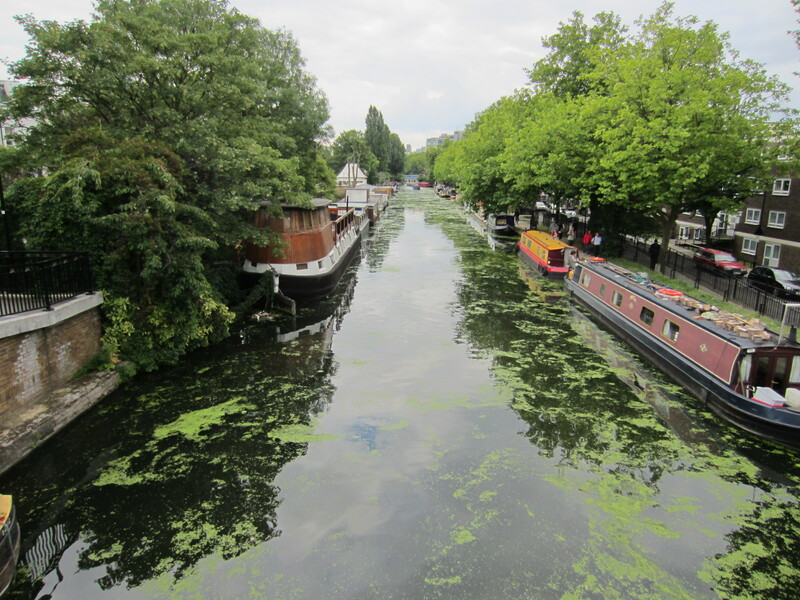 It took in an area that includes a part of England’s little-known network of canals that survives inside the metropolis. Our guide, Shaughan, was in good form. He brought to life the squalor of nineteenth century London, especially Maida Vale’s’s hellish cluster of piggeries, brick kilns, gin dens and brothels that today has become an enclave of the genteel middle class. It was a vivid lesson in history and (for me at least) in the politics of aesthetics. We passed an old brick kiln where once many hundreds of men, women and (nota bene) children risked their lives and ruined their health in smoked-filled filth to produce the bricks that built the grand houses of Victorian London. In those days the arbiters of taste would never have come anywhere near this spot, and would have sneered if anyone had dared call it “iconic” or “high class”. But today the kiln has become an admired architectural landmark. It houses a very up-market restaurant filled with rich diners. They eat there, in part, to display the exclusive discernment and refinement of their taste. Further along in the walk we stopped under the broad trees of Paddington Green where, with flapping hands and capering feet, our guide gave a spirited rendition of a popular 19th century song. Was pretty little Polly Perkins of Paddington Green. We then walked past the solid, multi-storey houses of several famous people including Victorian poets John Masefield and Robert Browning, and the contemporary pop celebrities Joan Collins and Annie Lennox. The walk concluded with an atmospheric stroll along the Regent’s Canal where we were able to see the exotic long narrow canal boats coming and going. Cambridge This walk is an all-day event. Swimming against the high tide of morning commuters washing through the halls of Kings Cross station you meet with London Walks guide Simon in front of an “authentic Cornish Pasty shop” run by Indians. A fast train fires you through the bright green of the English countryside to Cambridge, a trip of about ¾ hour. Here a brilliant melange of sights awaits you, from a ruined Norman fortress, to exotic narrow streets, to old churches sleeping in their gardens, to the ultimate… the soaring gothic extravagance of Kings College Chapel. I especially enjoyed the quick visit we made to a museum – part of Cambridge University – to see artefacts and specimens brought back from his voyages by Charles Darwin (if you ever do this, check out the extraordinary skeleton of a Galapagos tortoise). 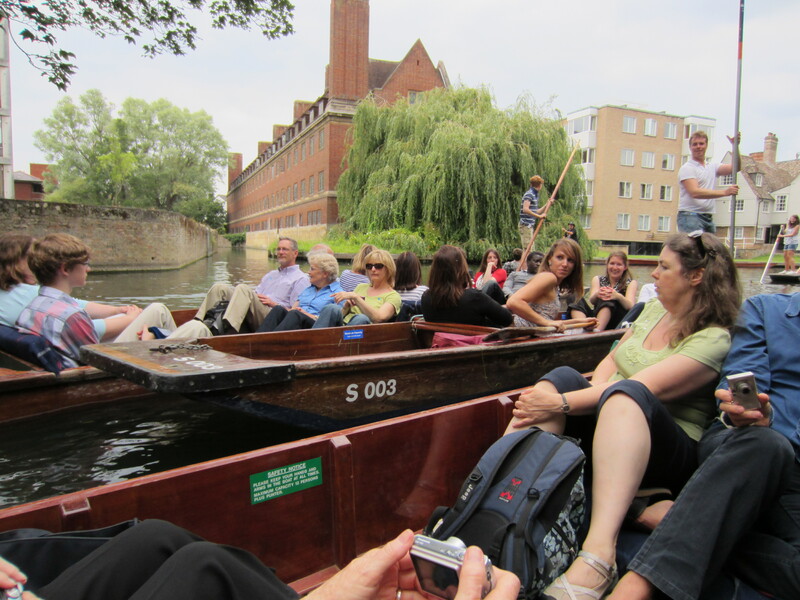 The climax of the day was an optional late afternoon punting excursion on the River Cam. Yes, there were banks of willows, a medieval windowed bridge, ivy-covered walls, verdant lawns sloping down to the water, and ducks swimming past with their ducklings in tow. But there was also an unpublicised downside. There are now so many punts on the modestly proportioned “river” that in places your voyage is more like a laboured stop-start bus trip through rush-hour traffic. The famed ducks are facing the same dangers that pedestrians face on a freeway. Certainly the idyll of punts being languidly poled through the rippling reflections of ancient buildings is gone. Today it’s “traffic jam on the River Cam” with the ducks squawking as they pop out from the vise-like clash of boats. Amateur gondoliers show off to their girlfriends, slithering about on the sterns of their boats and thrusting their poles at other punts as they wobble past. We were warned several times to keep our hands off the side of the punt in case our fingers got crushed by a neighbouring boat. Greenwich On the day we did it, this excursion was a small disaster. Actually, a big disaster. Emmy and I joined an expectant group of about 30 outside the Tower Hill tube station at 10.30 a.m. Our guide was Fedra whose small stature and very charming personality was belied by her granite-shattering voice and no-nonsense efficiency. In no time she had shepherded us to the Tower pier where she bought our tickets (discounted) on one of the fast ferries that ply the route down the Thames to Greenwich. That’s when her problems began. The so-called fast ferry took its time arriving, and when it did arrive it was packed. Only a small dribble of passengers disembarked, not enough to allow our party of 30+ to board. But we didn’t. The promised fast ferry didn’t turn up. Other passengers were filing aboard the succession of slower ferries that came and went, but at 12 noon – one and a half hours after handing over our cash – we were still standing in a queue a couple of hundred metres from our assembly point at Tower Hill station. Our patience was sustained by Fedra’s cheerfulness, but we could see that even she was starting to crack. Eventually we boarded a conventional “slow” ferry. Sitting on the upper deck among other passengers we had to endure the dreary patter and very tired jokes of an on-board, cockney “guide” who had commandeered the public address system. He ended his mechanical performance with a request for us to “show our gratitude”. He stood on the pier at Greenwich holding out a bucket into which the less discriminating passengers dropped their “gratitude”. As our group made its way up from the landing we had another disappointment. The great tea cutter of the 19th century, the Cutty Sark (a highlighted feature in the London Walks blurb), was not open to the public, in fact not visible at all. Ugly blue hoardings proclaimed that renovations were under way around the ship, I think in preparation for next year’s Olympic Games. And a fair swathe of the parkland and buildings of Greenwich had been fenced off and turned into the site for the Olympic equestrian competition. 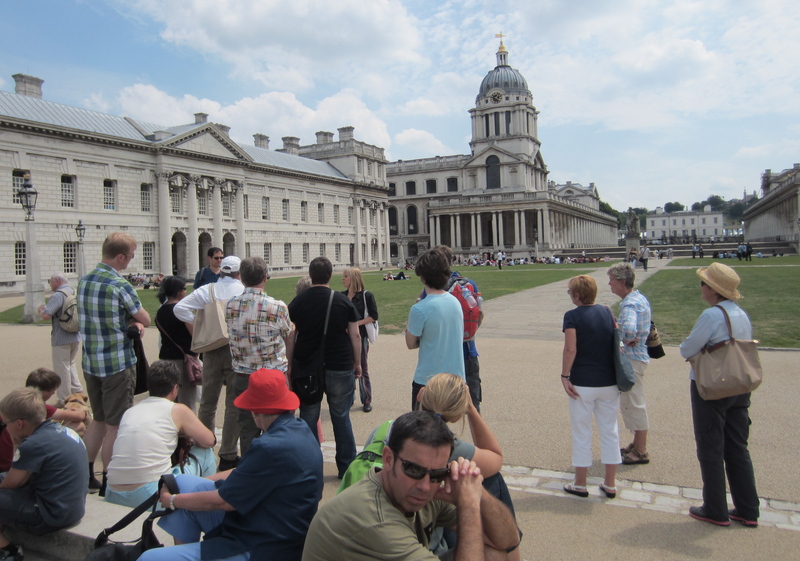 On the day of our visit some kind of “rehearsal” was taking place and parts of Greenwich were swarming with officious police. I’m no friend of high-level professional sport at the best of times so I was inwardly enraged that yet again there had been a capitulation to the hoons of sports officialdom, the people who think you can make history by chucking a ball through a hoop. But perhaps I shouldn’t have got upset. Frankly, with the exception of the genuinely fascinating 17th-18th century observatory (which was not part of our tour), Greenwich is as over-rated as an equestrian dressage event. Perhaps Greenwich and the top-hatted horse-bullies of dressage really do deserve each other. The celebrated buildings, like the Royal Naval College for example, are clunky, squat, pretentious, and (let’s face it) downright ugly. But they are BIG, and that is basically what gives them their tawdry status. This entry was posted in London by George Quinn. Bookmark the permalink.